Several Google Play Edition devices were pulled out from the Google Play Store after being out of stock for several weeks. These include the HTC One M7, Sony Xperia Z Ultra, and LG G Pad 8.3. 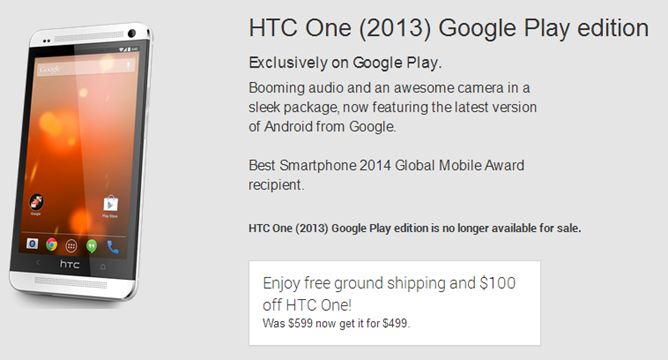 The only remaining devices are the HTC One M8, Moto G, and Samsung Galaxy S4. The Galaxy S4 is still listed as out of stock so it could eventually disappear as well. After all, a Google Play Edition of the Galaxy S5 is expected to replace it. With all these happening, one could not help but think that Google is probably replacing the Google Play Edition devices with Android Silver or just the Nexus devices. There is also a question of the public's interest in getting such devices. What do you think?